When it comes to the hotel industry, the customers’ expectations are to make secure, seamless, and speedy bookings. Now, inevitably the hotel industry is the most competitive of all. Hence, it is important to stay updated with the latest hotel industry trends to take advantage and stand out in the competition. According to the hotel industry experts, technology will completely reshape customer engagement in this industry sector. Today, all the guests are using multiple digital platforms and expect to engage with the hotels seamlessly across all of them. From small to large hotels, all are actively looking into new techniques to offer the optimal guest experience. These facts and more cannot be avoided and inadvertently, you as a hotelier ought to focus on the latest hotel trends which you know, will help in your hotel’s growth. Following these hospitality trends will help you improve loyalty and communicate better with the guests than ever before. The continuous zoom-in and zoom-out will leave your potential customers frustrated, and it might happen that the customers will leave your website and search for alternatives. Hence, in this digital era, it is vital for the hotels to offer an app that is mobile-optimized. Many hotels are making their websites mobile-optimized along with which, they provide a mobile app to encourage potential customers so that they can easily book rooms and check availability, read reviews, browse through hotel services, view hotel images, and more with the help of hotel app. It’s one of the ongoing hotel industry trends to provide a seamless browsing experience to guests through smartphones. Not only they can easily browse while on the move but can also see if you’re providing any offers, hosting any events, and so on through the app notifications. The hotel mobile app also lets you promote your properties and amenities in a unique and engaging way. Through their smartphones, your guests can use the digital key to speed up and efficiently undergo the check-in procedure. This is exactly what your guests need to gain instant access to their room. Swipe cards have been replaced with smartphones and apps to ease check-ins and reduce the loss of the key. This is one hotel trend you need to note. After an endless day filled with meetings or traveling, the guests feel to rush to their hotel rooms to take a shower and sink into a freshly made hotel bed. But in the middle of all that chaos, finding a room key is a headache. Hence, to avoid this frustration, today several hotel brands are rapidly rolling out smartphone keys. While talking about hotel industry trends, you should definitely take this into consideration as this will not only help you be updated with the demands and needs of your guests but also help you in offering a better experience. It’s obvious that the hotels can’t ignore the modern needs of the customers. And so, the hotels should provide modern services to remain competitive in the industry. In the era of mobile technology, the hoteliers can improve both their operations and the customer experience by implementing a few simple things at their hotels. Today, your guest doesn’t want to wait at your reception desk anymore. As the internet has become the inseparable part of their lives, the hotel guests are now expecting everything digital, which is a part of the recent hotel industry trends. Self-check-in service through kiosks and mobile guest self-service portals is gaining popularity among the top hospitality trends. With the implementation of such services in hotels, the guests can easily find out whether their room is ready, even make requests for amenities, check their bills, update their preferences and a lot more. This way, you can beat the long check-in process to improve the guest experience on arrivals (which is again, a job you should take on hand), which in turn will increase the guest satisfaction with your hotel. Technology has become critical to attract and retain hotel guests as a major part of the hotel industry trends. These days, most of the hotels, serviced apartments, B&Bs, guesthouses, resorts, and hostels even are moving towards the safe haven that a cutting-edge technology provides, to impart the best guest experience. Hotels are in the process of exploring the innovative technology solutions to better serve guests throughout their stay and help them remain on top of their mind. Hotel technology solutions like property management systems to manage the day-to-day of hotel operations and distribution management tools like hotel booking engine and hotel channel manager are coming to the rescue for hotels looking to streamline their operations, increase exposure and bookings. To be in the competition, the hospitality solution providers that build this kind of technology are frequently updating new features and innovations to be in the competition and empower hotels with better revenue management strategies and tools. Today, customers are becoming technology savvy. And so, in future – only the best technology will survive, the one that will be easy to use and convenient for the hotel staffs. To meet escalating guests experience, maximum hotels are spending or are going to spend on technology this year. Today, one of the most notable hotel industry trends is that hotels are using instant messages as a business tool to enhance customer experience. Instant messaging has transformed how potential guests and hotels communicate with each other. According to a data report, more than 90% of people in the US and UK have found the hotels’ text messages useful. Instant messaging adds a human touch to your online presence that allows potential customers to build a strong relationship with your hotel. The main benefit of an instant message is that your guests can access internal communication through their smartphone. That’s why this is said to be one of the most commendable hotel trends. You can use your hotel PMS software to send direct messages to your customers – be it a reminder related to their visit, offering discounts, or promoting your property to increase conversion and customer satisfaction. Billions of people around the world are using social media and the numbers are increasing day by day. The advanced technology has made it possible to reach out to the audience through multiple platforms. The social media not only helps hotels to promote the hotel and services but also gives an opportunity to attract different types of travelers at the same time. For instance; the youth, corporate business travelers, influencers, and more. 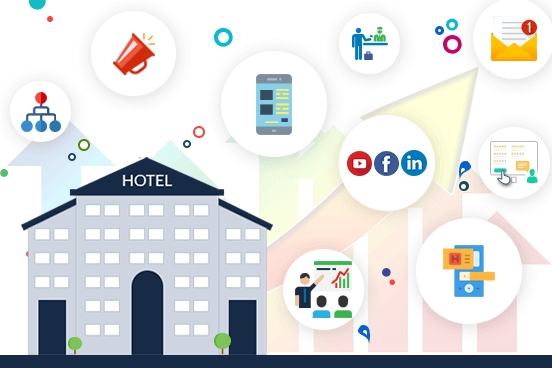 Hotels use Social Media not just as one among the hotel promotion ideas, but can also act as a customer care to drive revenue. That means, when customers visit your hotel facebook page and share their thoughts, they expect the answer. The interaction will help you to build the brand awareness and the loyalty among the customers. The online customers today shares all their travel and destination experience (with the photos like; where they went for a vacation, the hotel rooms, destination places, etc) on social media platforms for instance; Instagram and Facebook. All these social media posts act as a reference for other people who want to go for a vacation, looking for a stay, and seeking what are the available exciting menus there. Here, the hotels have the great opportunity to get into the conversation to spread the excitement and also build relationships. Hence, it is important for the hoteliers to convince the social media audience by highlighting experiences or guest stories online to attract the customers from social media platforms. Video marketing is becoming popular with time and has been skyrocketing in recent years. According to research, hotels will be able to attract nearly 80% of guests with video engagement. Videos are the powerful platform to highlight the specialists of your hotels and restaurants to give your customers the preview of what facilities you’re providing beforehand. Hence, you can attract the guests with videos of some delicious kitchen creations to entice the dining bookings or smart rooms to make them visit your hotel. 64% of the users are likely to book the rooms after watching a video. Therefore, all hotel brands can work on creating the custom videos for more guests engagement and turn them into your customers. Nowadays, it is difficult to maintain the guest relationship without proper knowledge of the technology. Technology is constantly evolving, and as the hotel technology providers are walking abreast with these trends and demands, even the hotel and the hotel staff needs to be in line with these hotel industry trends. However, it is important to provide the right training to the right people; mainly your hotel staff as they are the ones who are interacting with the guests. Hence, it is vital for the hotel staffs to learn about the new technology and that too effectively. Not only the staffs will be able to interact with the guests and attend to their requests, but the technology will also assist them in providing more personalized experience to the guests. Thus, today hoteliers are moving towards the technology solutions to communicate and engage with their guests. This ultimately improves guests experience – which is the ultimate goal in driving revenue and guests satisfaction. 81% of online customers still read reviews on TripAdvisor, Google, Booking.com, and other trusted sites before booking a room in a hotel. With the ongoing hotel trends of online reputation – the online hotel reputation management software is in raise to make it easier for the hoteliers manage their reputation with an ease. The online reputation management tool for hotels is not just a trend in 2018, but a critical requirement for every hotelier. This is because consumer behavior and booking pattern has changed greatly and will continue to change at a rapid pace in the coming times. The digital world has made the business transparent. Thus, people now can search and compare everything based on ratings and reviews, offerings, best deals, and quality services provided by the different hotels in the market. Reputation, recommendation, and online reviews help drive more bookings than any other factors. Hence, with the help of online reputation management, you can easily track your reputation and work on improvising your services to attract more guests at your hotel. Well, you can say those travel influencers are the new generation of reviewers that often provide a real-life experience of different hotels and their services through travel blogs and user-generated content on social media. This is one hotel industry trend you shouldn’t miss at all! The travel influencers have the power to engage your current and future guests as they give a personal touch and are known to build strong relationships with their followers. Therefore, to start engaging with your target audience (i.e. your guests) it is vital to target those who have the capability to influence the decision of your guests. With the help of the regular engagement – you can create a positive brand awareness and build up brand loyalty. Let them know what future deals you’re offering so that they will be able to share with their followers. Communicating with your influencers can provide you with informational data about your potential customers like; what are their expectations, and what facilities are exciting them the most and such likes. So, basically, approaching these influencers for your hotel marketing is one of the most effective hospitality trends. So… What are you waiting for? The adoption of the new technology is only going to spread in the hotel industry. Therefore, if you haven’t started yet, it’s a high time to embrace these new challenges, latest hotel industry trends invest in innovation, and turn your visitors into loyal customers by keeping them engaged.